Lisa Abbott is an educador who has taught children from kindergarten through grade 6. She received her M.Ed. from Lesley University in Cambridge, MA. She also received training from the Institute for Integrative Nutrition to practice as a health coach. Nutrition and fitness have always been an important part of her life. She has a vested interest in teaching children of all ages how to make healthy choices in order to lead healthy lives. I Dig Figs is her first book. I Dig Figs is an illustrated non-fiction children’s book written in rhyme by Lisa Abbott and illustrated by Sarah Fierle and Carolyn Szczepanski. Listing one healthy food for each letter of the alphabet, along with the nutritional benefits and delicious taste, readers are shown what each food looks like when it is bought and how it is used. The foods listed are asparagus, beet, cauliflower, date, eggplant, fig, ginger root, hemp seeds, iodine, jalapenos, kale, lemons, mushrooms, nutmeg, onions, parsnip, quinoa, radish, sauerkraut, turmeric, uncooked foods, Vitamin D, watercress, xigua (watermelon), yams and zucchini. Each food pinpoints which part of the body benefits greatly from eating it, whether it be your blood cells, muscles, eyes, legs or heart, and the book gives a basic description on how each of the foods can be prepared and eaten. 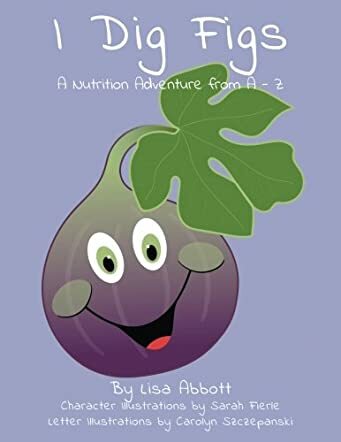 Although I Dig Figs is aimed at children, I felt quite entertained by the illustrations and learned something new with the health benefits of each of the foods listed. While some of the foods might not be your kettle of fish, you never know what a child likes until they try it for themselves. With obesity being such an overwhelming problem in the world, I applaud Lisa Abbott’s innovative and clever approach in getting people to try healthier alternatives to what they currently eat. I recommend this rather extraordinary book to readers of all ages and can already picture young children getting excited in a supermarket when they see a food which is shown in I Dig Figs, even if it is just because they can identify the food by name.